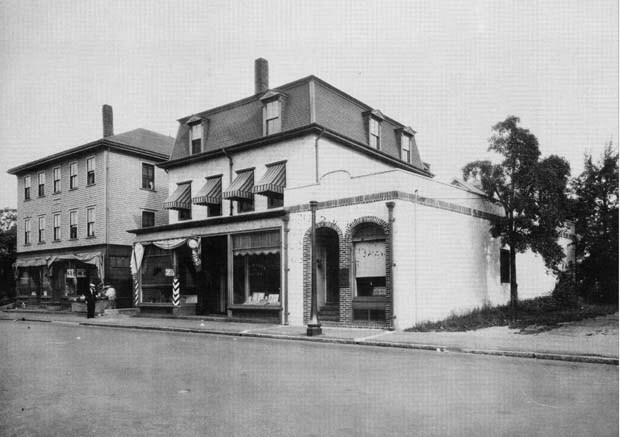 "The block on Albion Street known as the Stringer Block was occupied by the John T. Stringer Funeral Parlor, a firm which was established in 1911. In September, 1930, Stringer opened and formally dedicated a new funeral home. An open house was held from 10 a.m. to 10 p.m., and the public was invited to 'inspect the establishment and complete line of modern equipment' which made it 'one of the most up-to-date and fully equipped funeral homes of its kind.' The announcement of the grand opening also boasted of the installation of the 'latest' type of oil burner. Mr. Stringer's office was centrally located and the chapel, which accommodated 85 people 'seated', was at the rear of the building. The chapel addition had been 'stuccoed' in harmony with the finish of the funeral home. The chapel itself was determined to be a 'most welcome innovation...extremely useful when restricted space, inconvenient location or other sicknesses in the family' made it impractical to conduct the funeral from a private home. Mr. Stringer was also an insurance salesman and was very active in the Town of Wakefield. He was a member of the Expansion Board and served as the President of the Business Men for five years, among other endeavors." -- Text from calendar by Jayne M. D'Onofrio. “Stringer Block, 29 Albion Street, 1937,” NOBLE Digital Heritage, accessed April 20, 2019, https://digitalheritage.noblenet.org/noble/items/show/7086.